Photo radar measures vehicle speeds as vehicles pass a certain section of roadway and photographs any vehicle that exceeds the speed limit. Photo radar enforcement (Hallmark et al./Institute for Transportation). Photo radar measures vehicle speeds as vehicles pass a certain section of roadway. Also, photo radar takes a photograph of any vehicle that exceeds the speed limit. With the photograph of the vehicle, the license plate can be used to issue a citation to the driver of that vehicle. Some states require that citations be issued as moving violations with points assessed against drivers’ licenses. This type of measure is similar to standard enforcement but does not require an officer to be there at all times. Photo radar reinforcement can be used in most situations using permanent or portable units. Portable units can be moved constantly, which keeps the user from slowing down only in specific locations. Because of the high expenses involved with photo-radar reinforcement, high volume roads are the most effective locations to have them placed. San Jose, California implemented photo radar reinforcement using a fixed camera on 20 local streets. Thirteen of the streets saw speeds fall during peak hours (Ewing 1999). Not all states allow for photo radar enforcement. Photo radar reinforcement typically comes with a contracted turnkey option. This avoids the initial high cost by leasing the equipment and giving the provider a portion of the revenue from the citation. The typical cost for this option is $4,000 per month for the lease of the equipment, $3,000 for program operation, and $20 per citation issued. In addition to these costs are the annual cost of a police officer to review and issue the citation (Ewing 1999). Dixon, Karen, Hong Zhu, Jennifer Ogle, Johnell Brooks, Candice Hein, Priyank Aklluir, and Mathew Crisler. 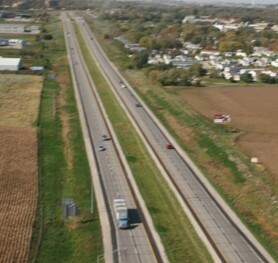 Determining Effective Roadway Design Treatments for Transitioning from Rural Areas to Urban Areas on State Highways. Report FHWA-OR-RD-09-02, Final Report SPR 631. FHWA, Oregon Department of Transportation, 2008.